Jeremy Pruitt during his days as Alabama's secondary coach. But Pruitt understood the point of the question, because it’s been the underlying theme of this week: Alabama and head coach Nick Saban, winner of three national championships since 2009, comes to visit Georgia, which has imported a number of Saban’s former staff members. Three of Georgia’s nine assistant coaches were on Saban’s staff recently: Pruitt from 2006-12, outside linebackers coach Kevin Sherrer (at Alabama from 2010-12) and offensive line coach Rob Sale (at Alabama from 2007-11). And Mark Hocke, Georgia’s strength and conditioning coach, was on Alabama’s strength staff the past six years. Saban was asked whether the opposition having so many ties to his program was a compliment or something to worry about. 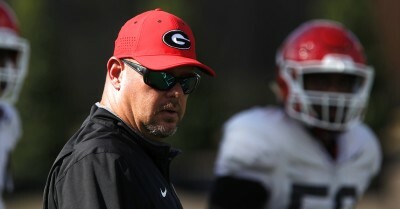 UGA linebackers coach Kevin Sherrer looks on during Wednesday’s practice. Sherrer served as Director of Player Development at Alabama before he was named a defensive assistant at the University of Georgia in January 2014. Pruitt and company have tried not to make a big deal of their Alabama ties this week. Pruitt sat for a press conference and happily (mostly happily) took questions about it. The other three haven’t been available for interviews this week. Their Georgia players also said the coaches haven’t made mention of their Alabama days, or used it in scouting reports. Georgia coach Mark Richt also has downplayed the Alabama influence, saying he didn’t set out to hire so many with ties to the Crimson Tide. It started when Will Friend, the team’s offensive line coach from 2011-14 and also an Alabama product, helped lure Pruitt, his college teammate away from Florida State in early 2014. Then Pruitt set about helping to bring in people he knew from Saban’s staff. Still, it’s hard not to see the creeping Saban influence into Richt’s program. A number of quality control staffers have been added, including a few with Alabama ties. The recruiting department’s staff was increased. Practice routines were tweaked, with a lot more energy on the defensive side the past two years. Media access was curtailed, especially to assistant coaches. Less information has been getting out in general. It also is evident in the way some coaches talk. Pruitt referred to the “organization,” a Saban-ism. And then there’s the strength and conditioning program, which Hocke took over this year. The most noticeable change in that, players say, is the competitiveness in every part of the day, from the weight room to everywhere else. 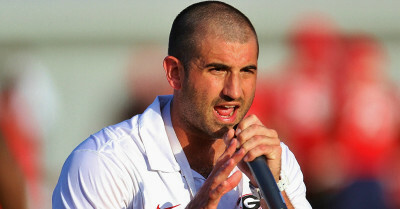 Indeed, while Hocke has yet to sit down for a media session since he was hired at Georgia, his quotes from practice – encouraging shouts often while jumping up and down – could fill up several stories by themselves. Richt, who himself came from Florida State in 2001, pointed out that there are assistant coaches with backgrounds at plenty of other programs: Auburn (defensive line coach Tracy Rocker), Southern California and Nebraska (inside linebackers coach Mike Ekeler), LSU (Sale played there) and Wisconsin (running backs coach Thomas Brown). So what about that question to Pruitt about helping Alabama to its three national titles? It was re-prefaced this way: He played a role in his six years in Alabama’s run. Did he take anything from there to Georgia?